The first version (solo guitar): Irina Kulikova(1). Recorded live at the International GLIWICE GUITAR FESTIVAL on 13 November 2011. The second version (for piano, Adagio Op. 44b): Keiko Nishizu. Recorded during a recital by the Japanese pianist in Polish Radio Gdańsk on 8th May 2013. The third version (for guitar duo, Adagio Op. 44c): Montenegrin Guitar Duo(2) (Goran Krivokapić and Danijel Cerović). Recorded live during the XVIth International GLIWICE GUITAR FESTIVAL in 2014. The fourth version (for guitar and flute duo, Adagio Op. 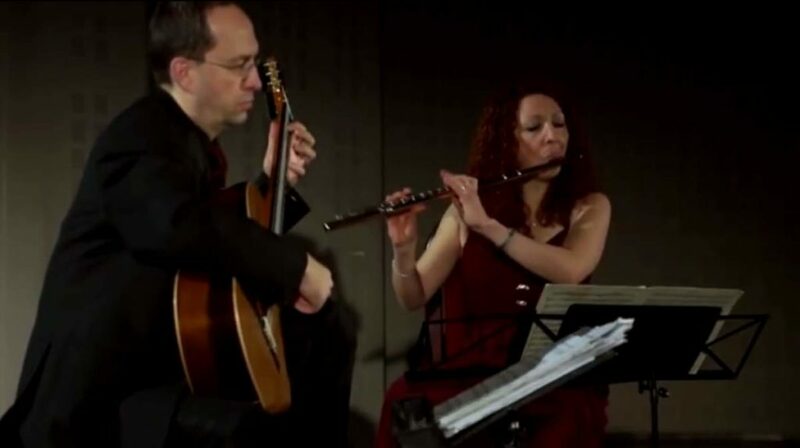 44e): The Cavatina Duo(3) (Spanish flutist Eugenia Moliner and the Bosnian guitarist Denis Azabagic). Recorded live during the XVth International GLIWICE GUITAR FESTIVAL in 2013. Irina Kulikova (born 30 April 1982 in Chelyabinsk) is a Russian classical guitarist. Under the guidance of Victor Kozlov and her mother, cellist Vinera Kulikova, she started developing her musicianship from the earliest age. At the age of twelve, she was already travelling around Russia and abroad for gala-concerts and festivals. When she reached fourteen, she was included in the book ‘The Classical Guitar, its evolution, players and personalities since 1800’ by Maurice Summerfield. Kulikova has given concerts all over Europe, Russia, and in North-America, performing as a soloist, in a variety of ensembles and with a number of orchestra’s. She played at leading guitar festivals all over the world and in beautiful halls like the Concertgebouw in Amsterdam, the Tchaikovsky Hall in Moscow, the Academic Capella in St. Petersburg and the Schloss Mirabel in Salzburg. She performed for various members of the royal and aristocratic families of Germany and Denmark. The experts’ appreciation of her interpretations is underlined by numerous awards on prestigious international guitar competitions, culminating with five 1st prizes in 2008: Michele Pittaluga in Italy, Guitarra Alhambra in Spain, Forum Gitarre Wien in Austria, the International Guitar competition Iserlohn in Germany and the “Twents Gitaarfestival” in the Netherlands, 2008. In the same year, she was awarded the Young talent, Culture and Podium prize in the Netherlands. Irina Kulikova graduated with distinction at the Mozarteum University in Salzburg (Austria), the Gnessins Academy in Moscow (Russia) and the Conservatoire of Maastricht (The Netherlands). She studied with outstanding musicians like Marco Tamayo, Carlo Marchione, Simone Fontanelli (modern music), Howard Penny (baroque music) and Hans Brüderl (baroque lute). Since 2007, Irina Kulikova lives and teaches in the Netherlands. In 2005, Irina Kulikova recorded her first solo CD, with works of Legnani, Mertz, Barríos Mangoré, Sor, Moreno-Torroba, Aguado and Rodrigo. In 2009, she released her second solo CD, in the Laureate Series of Naxos (as winner of the Michele Pittaluga competition in 2008), with works by Ponce, Tansman, Brouwer and José Maria Gallardo del Rey. In 2011, her third solo CD, titled “Reminiscences of Russia” was released. It is the first CD in the Laureate series of Naxos for winners of the Alhambra Competition in Spain. Montenegrin Guitar Duo (Goran Krivokapić and Danijel Cerović) caught the attention of international audiences and critics with their historically informed performances of J. S. Bach’s English Suites in a new, fresh approach on two guitars. Their repertoire includes the transcriptions of renaissance and baroque music and original compositions dating from the 19th and 20th century, with a special emphasis on the contemporary music originally written for two guitars as well as improvisation. Polish contemporary composer Gerard Drozd dedicated his concerto for two guitars and string quartet to the duo, as well as his “Homage to Bach” suite Op. 150. Other composers that wrote for the duo include Gustav Eichelberger and Krstyun Wrtoszlavsky. Montenegrin Guitar Duo’s ultimate goal is to broaden the guitar repertoire and further integrate guitar in the big family of classical instruments. The duo is frequently invited to prestigious international events (e.g. Festival Internacional de Musica y Danza de Granada, Kotor Art Festival, Koblenz Guitar Festival, A Tempo music festival) for recitals and concerts with orchestras as well as for masterclasses, lectures about transcribing Bach’s music and adjudicating competitions. Their performances in Montenegro, Germany, Spain, Poland, The Netherlands, Portugal, Luxembourg, Belgium, Croatia, Serbia, Slovenia, Bosnia and Herzegowina and Albania, have been highly acclaimed by both critics and audience. Their debut CD with works by Domeniconi, Piazzolla and Bogdanovic was published in 2013 by the Montenegrin Music Centre. In 2015 Naxos Records is publishing the first of two CDs of Bach’s English Suites, transcribed and performed by the Montenegrin Guitar Duo, making a world premiere recording of this unique project. Goran Krivokapić, born 1979, is one of the leading guitarists of the young international scene. Beside his technical virtuosity, reason for this is his characteristical interpretation of old and new repertoire. Apart from winning eighteen international competitions, he received several awards at the annual “International Guitar Convention in Alessandria”, Italy: 2005 as the best young guitarist of the year and 2006 for his debut CD “Best CD of the Year”. His breakthrough came in 2004 as winner of the two most prestigious competitions in North and South America (Canada and Chile). Since then he has performed in the most prestigious halls all over the world. As a soloist, Goran has performed accompanied by orchestras from Montenegro, Serbia, Germany, Italy, Chile, Hungary, Russia, Slovakia and Romania. As an artist, lecturer and adjudicator, he is a frequent guest at many international festivals and universities. Several television documentaries were made about him (TV Montenegro, TV Arte) and he performed for and gave interviews to TV and radio stations such as FOX7, Fine Music Radio, Hessische Rundfunk, WGBH Radio Boston, WDR. Various newspapers and music magazines wrote about him: Classical Guitar Magazine (UK), Akustik Gitarre (Germany), GendaiGuitar Magazine (Japan), Les Cahiers de la Guitare (France), Musica (Italy), Seicorde (Italy), MobilArt (Montenegro), Stampa (Italy). Goran Krivokapic’s focus is on the development of new works for classical guitar, mainly through transcribing Baroque and Classical works, but also collaborating with contemporary composers. Since 2010 he lectures a class of post-graduate students at the Koblenz International Guitar Academy. Danijel Cerović graduated on the Faculty of Music Arts in Belgrade in the class profesor Vera Ogrizovic and completed his master studies in guitar at the Conservatory in Maastricht (The Netherlands) in the class of Carlo Marchione. At the Music Academy in Cetinje, he obtained master degree. He attended master courses with renowned foreign performers and educators. Cerovic won numerous awards in competitions for guitar here and abroad. Cerovic regularly performs as a soloist and member of chamber ensembles at domestic and international festivals (Montenegro. Serbia, Bulgaria, Croatia, Slovenia, Macedonia, Greece, Germany,The Netherlands, Spain). As a soloist he has performed with the Montenegrin Symphony Orchestra, the Orchestra of Montenegrin Radio and Television, Mossani Strings (The Netherlands), Rubicon Quartet, as well as with prominent national and international artists such as Amanda Stojovic, Goran Krivokapic, B. Martinovic, M. Gjuro, O. Dukic and others. For “The Balkan Project” (Cedille 2010) Cavatina Duo commissioned new works for flute and guitar; they selected nine composers and chose music from the Balkans, reflecting Azabagic’s heritage. For their recently released CD “Cavatina at the Opera” (Bridge 2015), Eugenia and Denis commissioned long-time friend, composer and collaborator Alan Thomas to arrange/recompose for their combination some of the most beautiful and best-known fantasies and variations written for flute and ones written for guitar, making this an important addition to the flute and guitar repertoire.